3. Ningbo NO.5 Hospital (Ningbo Cancer Hospital), Ningbo 315201, China. *These authors contributed equally to this manuscript. Recent years, we have witnessed significant progresses in both basic and clinical studies regarding novel therapeutic strategies with genetically engineered T cells. Modification with chimeric antigen receptors (CARs) endows T cells with tumor specific cytotoxicity and thus induce anti-tumor immunity against malignancies. However, targeting solid tumors is more challenging than targeting B-cell malignancies with CAR-T cells because of the histopathological structure features, specific antigens shortage and strong immunosuppressive environment of solid tumors. Meanwhile, the on-target/off-tumor toxicity caused by relative expression of target on normal tissues is another issue that should be reckoned. Optimization of the design of CAR vectors, exploration of new targets, addition of safe switches and combination with other treatments bring new vitality to the CAR-T cell based immunotherapy against solid tumors. In this review, we focus on the major obstacles limiting the application of CAR-T cell therapy toward solid tumors and summarize the measures to refine this new cancer therapeutic modality. Keywords: chimeric antigen receptor, adoptive immunotherapy, cell therapy, solid tumor. Advances in our understanding on the interaction between the immune system and tumor cells have contributed to the rapid development of novel therapeutic strategies based on chimeric antigen receptor (CAR) or T cell receptor (TCR) modified T cells. CAR-T cell therapy has achieved outstanding progresses in clinical observations, which makes it even more attractive in the development of cancer adoptive immunotherapy. The CARs endow T cells with antigen-specific recognition, activation and proliferation in a major histocompatibility complex (MHC) independent manner , Currently, CARs have considerably evolved to the third generation, containing two co-stimulatory molecules, such as CD28+CD134 (OX40) or CD28+CD137 (4-1BB), which have usually been demonstrated with enhanced cytokine production and tumor lytic activity and reduced activation-induced cell death (AICD) than the second or first generation CARs . The emerging therapeutic approach of CAR-T cell therapy has sparked great interests, extensive studies in preclinical and clinical trials have revealed encouraging therapeutic efficacy in treating a variety of cancers, particularly in treating B-cell hematologic malignancies with CD19 CAR-T cells . Nevertheless, targeting solid tumors is more challenging than targeting hematological malignancies because of tumor histopathological characteristics, shortage of specific antigens and local strong immunosuppressive microenvironment . Furthermore, the on-target/off-tumor toxicity can pose significant risks. Thus, it is imperative to develop more competent and safer immunotherapy approaches by optimizing the design of CAR vectors, exploring new targets, incorporating conditional safe switches and combining with other strategies. And much work remains to be done to improve the efficacy of CAR-T cell therapy for solid tumors. It may be achieved, at least partially, by more extensive basic studies investigating the spatiotemporal dynamics of T cell activation by CARs and unraveling the connection between T cell migration in solid tumors and the effectiveness in eradication of solid tumors and metastases . In this review, we discuss the current status and major obstacles for the treatment of solid tumors with CAR-T cells, thus provide some potential measures to refine this novel therapeutic modality. It has been exclusively reported that CARs combine the exquisite antigen specificity of antibodies with the poly functionality and potency of cellular immunity. The unique structure of CAR endows T cells with tumor specific cytotoxicity and elevated anti-tumor activity in an MHC independent manner, through applying viral-vector technology or transposon-based system to transfect immune effector cells . The classic CARs consist of an extracellular antigen recognition domain, a hinge domain, a transmembrane (TM) domain and an intracellular domain (Fig 1) . The extracellular antigen-binding moiety in CARs, typically derived from a single chain variable fragment (scFv) that isolated from an antigen-specific monoclonal antibody, renders T cells the ability to bind antigens with retained specificity and affinity . The hinge region mediates CAR flexibility, transduces essential signals, and exerts profound impacts on ensuring the suitable positioning of the binding domain during scFv-antigen interactions (Fig 1A) . The transmembrane domains are derived from CD3-ζ, CD4, CD8, OX40, and H2-Kb  , and it has been clearly proved that the transmembrane domain can indeed influence the function of CAR-T cells . Other investigators suggested that CAR-T cells with the CD3-ζ transmembrane domain showed more potent cytolytic activity, while CAR-T cells with CD28 transmembrane domains were more persistent . A transmembrane domain from native CD3-ζ chain induces enhanced T-cell activation in comparison to mutated CD3-ζ transmembrane . The intracellular domain is responsible for signal delivery within CARs, this element has been manipulated extensively in an attempt to optimize functions of engineered T cells. T cell activation relies on the phosphorylation of immune receptor tyrosine based activation motifs (ITAMs) presented in the cytoplasmic CD3-ζ domain of the TCR complex  (Fig 1B). 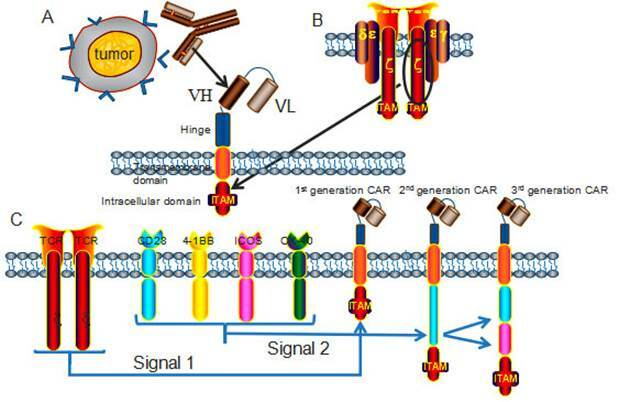 The signaling domain is critical for CAR-T cells to fulfill anti-tumor functions, the construct of CARs has seen several incarnations according to the different compositions of signaling domain. Chimeric antigen receptors (CARs) architecture. (A) CARs consist of an extracellular domain, a hinge, a transmembrane domain, and an intracellular domain. The extracellular domain is typically a scFv fragment that isolated from an antigen-specific monoclonal antibody, with retained specificity and affinity. (B) The intracellular domain, derived from the phosphorylation of immunoreceptor tyrosine based activation motifs (ITAMs) presented in the cytoplasmic CD3-ζ domain of the TCR complex, transmits activation and co-stimulatory signals to T cells. (C) According to the number of signaling molecules, CARs are classified into the 1st generation (one), 2nd generation (two) and 3rd generation (three) CARs. The most applied co-stimulatory signaling molecules are CD28, 4-1BB, ICOS and OX-40. The first generation CARs provided the proof for the concept of the targeting and activation of CAR-T cells, but had very modest clinical activity and poor persistence in vivo , to overcome these limitations, the second and third generation CARs have incorporated co-stimulatory molecules, including CD27, CD28, CD134, CD137 and ICOS . CAR-T cells with multiple signaling receptors have been demonstrated with sustained proliferation, enhanced cytokine production, improved tumor lytic activity, and reduced AICD both in vitro and in vivo  (Fig 1C). Nowadays, the second-generation CAR-T cells have been more exclusively and ubiquitously applied in clinical trials than the third generation CAR-T cells, because the reduced activation threshold of the third generation CAR-T cells may cause on-target/off-tumor side effects to normal tissues. The use of CARs confers several advantages over TCR transgenes. Based on the MHC independent antigen recognition, CARs are able to bypass the mechanism that employed by tumors to evade immune detection through down-regulating MHC-I molecule . Theoretically, CARs are able to detect almost all antigens that can be recognized by antibodies, including protein antigens, carbohydrate and lipid antigens and so on, that is, CARs are more universally applicable for immunotherapy to treat diseases . In addition, the intracellular signaling domains within CARs are more flexible so that can be designed to compensate the down-regulation of co-stimulatory molecules induced by cancer cells . Therefore, CAR-T cells harness maximal treatment resources for adoptive immunotherapy over TCR-T cells, for which the main hurdle is that the effect is HLA/MHC dependent. The promising clinical trials have generated remarkable responses in cancer patients, which provided a solid foundation for inspiring the application of CAR-T cell based adoptive cell immunotherapy in multiple oncological settings. To date, clinical trials utilizing the second generation CD19 CAR-T cells to treat hematological malignancies have resulted in the most encouraging clinical responses , and the CD19-CAR T cell therapy (CTL019) has been highly appraised and approved as the breakthrough therapy by the FDA. Currently, adoptive CAR-T cells focusing on CD20 are also being evaluated in clinical trials for the treatment of B-cell malignancies, for which other CAR-T cells targeting CD22, CD30 and CD33 are now at the stage of in vitro trials . At present, CAR-T cell therapy has demonstrated success as a novel treatment modality that the commercial manufacture of gene-modified T cells at industrial scale for the treatment of advanced cancers is becoming a hotspot worldwide. Mention worthy, the Juno therapeutics, Novartis and Kite are leading Big Pharmacies in the world due to their pioneering contributions to the development of CAR-T cell therapy. Figure 2 shows a flow chart of adoptive immunotherapy using CAR-T cells in clinical treatment. In contrast to the remarkable clinical responses of CAR-T cell immunotherapy for hematologic malignancies, treating solid tumors with CAR-T cells has been limited by tumor histopathological structure and strong immunosuppressive environment, wherein the lack of ideal target is another crucial deficiency for the treatment of solid tumors. Currently the preferred therapeutic targets to treat ovarian cancer and neuroblastoma with CAR-T cells are FRα and GD2 respectively . The updated statistics of therapeutic targets in solid tumor immunotherapy with CAR-T cells are showed in table 1. Schema of adoptive cellular therapy with CAR-T cells. PBLs harvested from specifically selected patients. T cells were isolated, activated and genetically modified to express a transgene encoding tumor-specific CARs. The genetically modified T cells are then expanded on a large scale using a cell processing center in vitro to a sufficient number, and thus infused back into patients, with or without chemo-radio therapeutic preconditioning. Therapeutic targets in treating solid tumors with CAR-T cells. FRα, α-folate receptor; L1-CAM, L1-cell adhesion molecule; CAIX, carboxy-anhydrase-IX; FAP, Fibroblast activation protein; HER2, human epidermal growth factor receptor 2; CEA, carcinoembryonic antigen; PSMA, Prostate Specific Membrane Antigen; CEA, Carcino Embryonie Antigen. CAR-T cells recognize cell surface antigens through scFv structures, which typically contain the variable domains of the light and heavy chains, in non-MHC restricted manner . The membrane protein CD19 is widely expressed by almost all the B cells, and B-cell hematologic malignancies are with relatively uniform structure characteristics and so on . All these properties lead to that most patients with B-cell malignancies exhibited inspiring curative effect after CD19 CAR-T cell therapy. But the application of CAR-T cell therapy in solid tumor treatment is severely limited by heterogeneity characteristics, shortage of tumor specific antigens and immunosuppressive microenvironment. Now we make an analysis on the limiting factors for the application of CAR-T cells in solid tumor treatment and discuss the relevant countermeasures. Most hematologic malignancies are associated with hematopoietic stem cell regeneration dysfunction , without forming tissue structure. In contrast, solid tumors have special histopathological features, such as high concentration of blood vessel, wide gap of vessel wall clearance, extensive vascular leakage, poor integrity of issue structure, and so on. And these features cause selectively enhanced permeability and retention of lipid particles and macromolecular substances within solid tumors. The phenomenon of enhanced permeability and retention effect is called the EPR effect [41, 42]. The presence of high number of tumor-infiltrating lymphocytes (TIL) and extensive infiltration have been found as major indicators of favorable patient prognosis and positive therapeutic responses in treating several solid tumors , including colorectal cancer , lung cancer , and ovarian carcinomas [46, 47]. The EPR effect of solid tumor and the suppressive nature of the tumor microenvironment play important roles in impeding the infiltration into tumor tissues of effector T lymphocytes [48, 49]. Understanding and manipulating the factors contributing to the infiltration of T lymphocytes can be helpful to further improve the selective targeting of tumor tissues. The process of T cells trafficking include rolling, adhesion, extravasation, and chemotaxis , and the trafficking of T cells to the tumor microenvironment is essential for the success of T cell based cancer immunotherapy. The clinical curative effect of T cell based immunotherapy against solid tumors has been more moderate than advanced melanoma or hematologic malignancies, overcoming hurdles of the migration of T cells is one of the major challenges in CAR-T cell immunotherapy, mismatching of chemokine-chemokine receptor pairs, down regulation of adhesion molecules, and aberrant vasculature may also contribute to the poor homing of T cells. Studies have found that the CD3+, CD8+ T cell as well as B lymphocytes infiltrations are significantly correlated with the existence of tumor high endothelial venules (HEVs). Tumor HEVs are specifically located in lymphocytes concentrated areas, high density of tumor HEVs predicts low risk of relapse and metastasis [43, 51]. It is also an important access for lymphocyte infiltration into tumor sites, being associated with clinical prognosis makes it an indicator of tumor diagnosis and therapy. Over-expression of endothelin B receptor (ETBR) in tumor blood vessels is another limiting factor of lymphocyte infiltrating into tumor tissues through impeding the adhesion of lymphocyte to vascular endothelium . And tumor angiogenesis has been found down-regulating endothelial cell-adhesion molecules, such as intercellular adhesion molecule 1 (ICAM-1) . All the above limiting factors block the homing of T cells and thus impact the efficiency of tumor immunotherapy. Theoretically, ETBR blockade and ICAM-1 up-regulation could therapeutically promote T cells homing and enhance immunotherapy efficacy. ETBR inhibitor BQ-788 (a specific ETBR inhibitor peptide) has been revealed increasing T cell adhesion to human endothelium in vitro. Angiogenesis is a prerequisite for the outgrowth and metastasis of cancer cells , some angiogenic factors produced by tumor cells are responsible for the down-regulation of ICAM-1. For example, previous evidences have showed the up-regulation of ICAM-1 expression of human umbilical vein endothelial cells (HUVECs) after VEGF stimulation. But in contrast, prolonged stimulation (which occurs during the development of tumor) results in the down-regulation of ICAM-1 expression and leukocyte adhesion . In addition, tumor necrosis factor-α (TNF-α) also induces the up-regulation of ICAM-1 . Some relevant strategies to enhance the trafficking of CAR-T cells into solid tumors are discussed below. A potential result of the special histopathological structure of solid tumor may lie in the observed lack of sufficient T cells within tumor tissues. Similarly, the insufficient migration of CAR-T cells to tumor sites also critically limits the efficacy of CAR-T cell immunotherapy against solid tumors. The limiting impact may result from unfavorable chemokine gradients, which means that tumor-specific T cells may lack the appropriate chemokine receptors for chemokines secreted by tumor cells . Tumor-derived chemokines are also attractive targets for CAR-T cell immunotherapy due to their immune-modulatory effects: decrease the immunogenicity of tumors and the desensitization of chemokine receptors on T cells . At the same time, tumor cells can utilize chemokines in this manner to provide autocrine growth signals and signals to enhance angiogenesis . Thereby, once these tumor cells are eliminated, the remaining tumor cells will be more vulnerable. These above mechanisms envision the possibility to redirect T cells to predetermined targets through arming T cells with relevant chemokine receptors. Several studies have verified this principle through arming CAR-T cells with the expression of CXCR2 (CXCL1 receptor) , CCR4 (CCL17 receptor), Gro-a, CCL17 , and CCL2. Nevertheless, tumor cells adopt multiple inhibitory strategies, it is challenging to derive CAR-T cells accommodating all the immune-modulatory genes which are required to overcome tumor inhibition while increasing CAR-T cell trafficking, survival, and safety . Some researchers resorted to oncolytic viruses, which selectively infect, lyse, and replicate in malignant cells while sparing normal cells to solve this complex task by arming CAR-T cells with oncolytic virus expressing the chemokine RANTES and the cytokine IL-15 . In addition, the difference of T cell administration also exerts an important impact on CAR-T cells expansion and effector differentiation. Studies have evaluated two different routes of CAR-T cells delivery, regional intra-pleural administration and conventional systemic intravenous of mesothelin-targeted M28z CAR-T cells, the former route presented robust T cells persistence and enhanced anti-tumor efficacy compared to the latter by circumventing obligate circulation and transient pulmonary sequestration . Similarly, the intra-cerebral injection method of CAR-T cells has also been applied to treat glioblastoma with CAR-T cells to avoid the traffic blocking blood brain barrier . The remarkable ability of regional delivery of CAR-T cells provides another approach to enhance functional T cell persistence and improve therapeutic efficacy through choosing favorable traffic route for CAR-T cells. Inflammatory cells have a significant correlation with the growth and metastasis of cancer cells, indicating an improvement measure for CAR-T cell therapy by modulating tumor stroma through engineering CAR-T cells to secrete cytokines, such as interleukin-12 (IL-12) [66, 67]. The mechanism is that once activated by the CAR vector, T cells secrete IL-12, which can further activate innate immune cells response toward tumor cells that are invisible to CAR-T cells and subsequent inaccessible to antigen-directed immunotherapy, the process of T cells redirected for universal cytokine-mediated killing is also known as TRUCKs . The TRUCKs have been demonstrated with remarkable therapeutic efficacy against tumors in pre-clinical models. So design T cells redirected by a tumor-targeting CAR and additionally engineered with a CAR-inducible cytokine cassette upon CAR engagement of cognate antigen (also termed as the fourth generation CARs by some scientists), such as the CAR-inducible IL-12 (iIL-12), which has been revealed with recruiting macrophage effect [69, 70]. This design can supplement the defect that CAR-T cell can't eliminate inaccessible tumor lesions, in a manner associated with reduced systemic toxicity. Cytokine and stimulation conditions are indispensable ingredients in the process of CAR-T cells manufacturing, and several reports have indicated the influence of cytokines and growth conditions on the expansion and phenotype of immune T cells [71-73]. Thus, determining the choice of cytokines and optimizing the growth conditions are crucial for the expansion and related anti-tumor activity of CAR-T cells. The cytokines of IL-7 and IL-15 or IL-2 are mostly used as growth factors for the culture of CAR-T cells . Studies have shown that IL-7 and IL-15 are superior to IL-2 for preserving CAR-T cell expansion in vitro and in vivo, CAR-T cells fed with IL-7 and IL-15 showed more sustained expansion and superior survival when exposed to serial antigens stimulation, and thus exhibited enhanced persistence and antitumor activity [75, 76]. In conclusion, these approaches lead to better living conditions for CAR-T cells, and can be translated into clinical immunotherapy. The solid tumor heterogeneity in biological structure is a preponderant limiting factor of CAR-T cell immunotherapy for solid tumors. Tumor heterogeneity may result from subject factors and individual factors. The subject factors include the differences in cell origin and patient ethnicity, diversity that caused by genetic and epigenetic changes . While the individual factors are mainly caused by tumor physiological heterogeneity among patients, intra-tumor heterogeneity, different distribution of an individual tumor, the presence of cancer stem cells or the direction of evolution . Tumor heterogeneity results in that the immunotherapy target become specific to only a portion of tumor cells, which worsens the prognosis of patient and increases the recurrence and metastasis of cancer. Therefore, the most advantageous method to treat solid tumors with CAR-T cells is to identify and project the specific cell surface antigens, but this optimal selection is severely hindered by the shortage of tumor specific antigens (TSA) under the circumstances of high heterogeneity. The posterior selection is tumor associated antigens (TAA) that relatively over expressed on the tumor cell surface, but CAR-T cells targeting TAAs may cause collateral damage to normal tissues. Therefore, new strategies improving the safety of clinical practice while maintaining the anti-tumor activity of CAR-T cells, including target tumor cell specific neoantigens that derived from somatic mutations of tumor cells (e.g. mutant EGFR variant III), target intracellular antigens (e.g.WT1, a peptide induced by Wilms' tumor gene 1), optimize CAR system with bi-signal independent pathways, apply suicide gene and other safe switches. Epidermal growth factor receptor (EGFR) is a member of HER2 family, which frequently overexpressed in cancers and negatively correlated with clinical efficiency of treatment , and this makes it an inspiring research target. Researchers have found that 40-70% of brain tumors express mutant EGFR variant III (EGFRvIII) with a deletion of exons 2-7 of EGFR, which causes a defect in the extracellular ligand-binding domain and constitutive activation in a ligand-independent manner [80, 81]. Its specific expression on tumor cells, significant correlation with invasion and angiogenesis of tumors and patients' survival make EGFRvIII a novel promising target . Arming polyclonal CTLs with tumor-specific TCR can avoid many obstacles in cellular immunotherapy, and this is called ''T-body'' approach [80, 83]. So the EGFRvIII targeting CAR system was utilized in the treatment of EGFRvIII expressing gliomas, and the generated T-body approach was able to secrete cytokines and lyse tumor cells in an EGFRvIII-dependent manner. This research brings us a new direction for CAR-T cell therapy, that is, to target specific tumor cell phenotypes induced by mutations of tumor cells. Recognition of the peptide/MHC class I complexes endues T lymphocytes specific anti-tumor efficacy and enhanced cytokine secretion. Simultaneously, incorporation of the co-stimulatory signals or CD8+ adhesion molecules to the CARs can enhance the activation of T cells . Peptide WT1, presented in the context of HLA-A* 02:01 (RMF/A2) , is an important immunologically validated oncogenic target with limited expression in normal tissues, while overexpressed in majority of leukemia and a wide range of solid tumors, especially mesothelioma and ovarian cancer [86, 87]. Therefore, CAR-T cells that targeting WT1 is a good improvement project. The modified CAR-T cells, containing the antigen recognition domain derived from fully human TCR-like ESK1 mAb (Called WT1 28z) have been found cytotoxic to primary AML bone marrow cells through targeting the intracellular oncoprotein WT1 . Compared with targeting other antigens, WT1 28z CAR-T cells showed improved secretion of pro-inflammatory cytokines, such as IFN-γ, IL-2. And the therapeutic potential of TCR-like scFv CAR-T cells was proved able to be further enhanced by affinity maturation of the scFv fragment, such as TCR-like Q2L mAb derived scFv . Hence, these researches indicate that improvement to the anti-tumor activity of CAR-T cells can be made through bidirectional modification of CAR-T cells to target intracellular antigens. Mesothelin, a kind of cell surface glycoprotein with molecular weight of 40 kDa, is gaining much attention in clinical therapy of advanced solid tumors due to its high expression on the surface of numerous solid tumor cells . As reported on the American Association for Cancer Research, a phase I study from Novartis and the University of Pennsylvania is ongoing, meso-CAR T cells were administered to advanced cancer patients who were no longer responding to multiple lines of prior therapies, the results indicated safety and pretty functionality in treated patients (table 1). Mesothelin expression is also found in normal tissues, which raises a concern that meso-CAR T cells may damage healthy tissues and organs [91-93]. Researchers found some evidences showing that the meso-CAR T cells were detectable in the fluid around the heart of patients, but there were no related toxicities reported . Although meso-CAR T cells program is still being evaluated, there is no doubt that mesothelin is another promising protein target and opens up the possibility that such an approach can benefit patients with various solid tumors. In order to improve the specificity of CAR-T cells, separate dual CAR system was designed to recognize two different tumor antigens and separately transmit the first and second signals that are essential for T cell activation . The co-transduced T cells maintain the therapeutic efficacy on the basis of the second generation and the third generation CARs, which empowers wider use of CAR-T cells and avoids potential safety issues. Theoretically, the co-transduced T cells only destroy tumor cells that express both antigens (double positive) instead of these that express either antigen (single positive). However, studies have confirmed that co-transduced T cells are cytolytic against both single positive and double positive tumor cells. The most possible explanation is that the CARs transmitting the first signal have too robust stimulatory functions on T cells, and activate T cells even without the second signal. Thus in 2012, Kloss CC and colleagues reduced the affinity of the CARs that are responsible for transmitting the first signal in the dual CAR system and reported that co-transduced CAR-T cells did not exhibit cytolytic activity against single positive tumor cells but double positive tumor cells . This research opened the door of adjusting the affinity to improve CAR-T cell specificity and thus safety performance. Recently, the validity of the above strategy, through adjusting the affinity of the scFv components of CARs to selectively target tumor cells from normal cells, so as to reduce the off-target effects and improve the safety performance, was further verified. Tuning the functional affinity of CAR was performed to selectively target tumor cells overexpressing EGFR from normal cells based on the disparate density of EGFR expression . The use of affinity-tuned scFv to target HER2 has found that decreasing the affinity of the scFv could significantly increase the therapeutic index of CAR-T cells . Thus, another direction to improve safety performance of CAR-T cell based immunotherapy against solid tumors is tuning the functional affinity of CARs to discriminate the overexpressing tumor cells from normal tissues that express target at physiologic levels. Clinical application of CAR-T cells suggested that the anti-tumor efficacy is associated with some degree of toxicity , especially when targeting TAAs which are also expressed on normal cells. Therefore, strategies are needed to reverse any sign of toxicity effect. Adding the “ideal” suicide gene to the construct of CARs can lead to selective ablation of gene modified T cells, thus prevent collateral damage to normal tissues or organs . Therefore, CAR-T cell application with transgenic expression of one or two suicide genes is advisable, at the same time, the selective suicide gene would ensure the safety by irreversible elimination of specific part cells that are responsible for the unwanted toxicity. Currently, two validated suicide genes have been successfully used in clinical setting, herpes-simplex-thymidine-kinase (HSV-TK) and inducible-caspase-9 (iCasp9) to enhance the safety of CAR-T cell therapy against hematologic malignancies [101, 102]. So applying suicide gene modification to CAR-T cells may greatly increase the safety performance and clinical therapeutic efficacy. The clinical therapeutic efficacy of CAR-T cells in the treatment of solid tumors keeps a marginal characteristics compared with hematological malignancies, because the efficacy is significantly impeded by the strong immunosuppressive environment of solid tumors [4, 103]. The relative kinetics of CAR-T cells accumulation versus the rate of inactivation within solid tumors will ultimately determine the overall anti-tumor efficacy, and the balance will likely to be tumor-specific. The limiting factors that hinder T cells efficiency within solid tumor microenvironment are mainly from two aspects: 1) intrinsic microenvironment characteristics, such as hypoxia and low pH, the lack of arginine or tryptophan, inhibitory effects of tumor-derived cytokines, 2) inhibitory pathways against activated T cells, including intrinsic inhibitory pathways mediated by up-regulation of inhibitory receptors , intracellular inhibitory pathways to inhibit T cell receptor pathways , and effector functions after T cell activation . Advanced generation of CAR-T cell inactivation is reversible within the solid tumor microenvironment by multiple mechanisms. Studies have showed that CAR-T cells undergo rapid loss of functional activity limited their therapeutic efficacy within solid tumor microenvironment, but this hypo-function was reversible when the CAR-T cells were isolated away from the tumor . Whether this reversible characteristics can be attributed to the removal of inhibitory factors that reside in the tumor microenvironment is being investigated. Therefore, it is of great interests to optimize the efficacy of CAR-T cell therapy by combining with other treatments for solid tumors. As mentioned above, solid tumors employ a variety of countermeasures to impair the function of CAR-T cells. Within the tumor microenvironment, the activated CAR-T cells are exhausted by many negative signal-regulated pathways, including cognate ligands reacting with their up-regulated inhibitory receptors expressed on T cells  and the lack of ligands for T cell co-stimulatory receptors . Tumors exploit negative control signals to attenuate CAR-T cell responses, such as programmed death ligand 1 (PD-L1), which interacts with programmed death 1 (PD-1) expressed on activated T cells, and this exhausts CAR-T cells . So developing a new engineering strategy to equip CAR-T cells with the capacity to convert tumor negative signal-regulated pathways into regulating pathways will be helpful, such as constructing a new chimera to convert cognate ligand into a ligand for T cell co-stimulation receptor by exchanging its transmembrane and cytoplasmic tail with that of CD28 or 4-1BB. The validated PD1: CD28 chimera was shown to efficiently convert PD-L1 into a co-stimulation ligand of primary human CD8+ CTL, resulting in enhanced cytokine secretion, increased proliferative capacity and augmented anti-tumor activity . It is reasonable to speculate that genetic modification of CAR-T cells to express the above new type of chimera may greatly enhance the anti-tumor functions and also provide a platform to improve the clinical efficacy of CAR-T cell therapy under the immunosuppressive environment of solid tumors. With the exploration of solid tumor immunology, the tumor-associated stroma, occupying up to 90% of the tumor volume, has gained increasing attention for its role in initiating and sustaining tumor growth . Cancer associated fibroblasts (CAFs), the principle ingredient of the tumor-associated stroma, play a preponderant influence in the formation of a highly protumorigenic and immunosuppressive microenvironment that mediates therapeutic resistance . Additionally, immunotherapies with CAR-T cells targeting tumor- associated antigens (TAAs) often fail to eradicate CAFs, which support tumor progression directly through paracrine secretion of cytokines and growth factors. Therefore, CAR-T cells targeting TAAs combine with CAR-T cells targeting CAFs may augment the anti-tumor function. The treatment by co-targeting CAFs in addition to cancer cells has been validated with significantly enhanced anti-tumor effects against solid tumors when compared with the treatment targeting CAFs or tumor cells alone. An immunotherapeutic target expressed on CAFs within a majority of solid tumors is necessary, fibroblast activation protein-α (FAP), a type 2 dipeptidyl peptidase, is a marker of a major subset of stromal cells in virtually carcinomas , making it an attractive therapeutic target. Studies have showed that genetically modified T cells with the expression of FAP-specific CAR can effectively recognize and kill FAP-positive tumor cells . When combined with CAR-T cells targeting TAAs, FAP-specific CAR-T cells presented ever more attractive anti-tumor effects . This novel combination provides another direction for solid tumor immunotherapy. The field of cancer immunotherapy has considerably expanded with several new treatment options: immune checkpoint inhibitors, cancer vaccines, and adoptive T-cell immunotherapies. However, many drawbacks are still exist in efficacy, such as, immune checkpoint inhibitors are efficacious for just few patients with high mutation loaded melanoma and lung cancer, the efficacy in treating solid tumors with CAR-T cells is limited due to the unfavorable microenvironment [117, 118]. Thus, combination therapy of CAR-T cells with immune checkpoint inhibitors may be a solution. Recently, CAR-T cell therapy was combined with immune checkpoint inhibitors, which can create more favorable microenvironment by reducing its immunosuppressive effect to improve the efficacy of CAR-T cell therapy, and many clinical trials of combination therapy of CAR-T cells with checkpoint inhibitors are ongoing . In addition to immune checkpoint inhibitors, CAR-T cell therapy has also been combined with oncolytic virus expressing the chemokine RANTES and the cytokine IL-15, and showed enhanced function of CAR-T cells by improving CAR-T cell trafficking and recruiting innate immune cells . In conclusion, combination therapy of CAR-T cells with other treatments holds great potential for treating solid tumors. CAR-T cell based immunotherapy has made a great success in treating B cell malignancies, but targeting solid tumors remains a tough task mainly due to the scarcity of TSAs and suppressive environment of solid tumors. However, researchers have been trying to improve the efficacy of CAR-T cell therapy against various solid tumors from many aspects including: 1) arming with cytokine or chemokine to enhance the infiltration of T cells and recruit other immune effectors; 2) optimizing the culture conditions to derive more potent CAR-T cells; 3) modifying the targeting system by changing the antigen recognition domain toward intracellular antigens or neo-antigens even bi-directional; 4) reducing the on-target/off tumor effect by applying dual targeting system, tuning the affinity of scFv fragments and applying safe switches; 5) combining with other treatments to eliminate tumor cells more thoroughly. Many clinical trials of CAR-T cell therapy targeting different antigens for treating solid tumors are ongoing. Nevertheless, mechanical studies on how CARs activate T cells, comparison between CAR and TCR, and optimization on each element in CARs are still needed to better apply CAR-T cell based immunotherapy in treating solid tumors. This work was supported by the Chinese Key Project for Infectious Diseases (No. 2012ZX0002-014-005, 2013ZX10002-010-007), the Military Youth Project (No. 13QNP101), the State Project for Essential Drug Research and Development (2013ZX09102-060) and the Chinese State 863 projects (No. 2012AA020806). Zhang H and Ye Z wrote the manuscript. Zhang H, Ye Z, Jin H and Qian Q conceived the study and revised the manuscript. Gang Y and Luo Z assisted searching the literature and provided conceptual input. All the authors participated in the discussion of the study, have read and approved the final manuscript. Corresponding authors: Qi-Jun Qian, Tel: + 86-21-81875371; Fax: + 86-21-65580677; E-mail: qianqjcn; Hua-Jun Jin, Tel: + 86-21-81875372; E-mail: hj-jincom.